Lately I’ve been talking with a lot of friends and family about the upcoming provincial election. 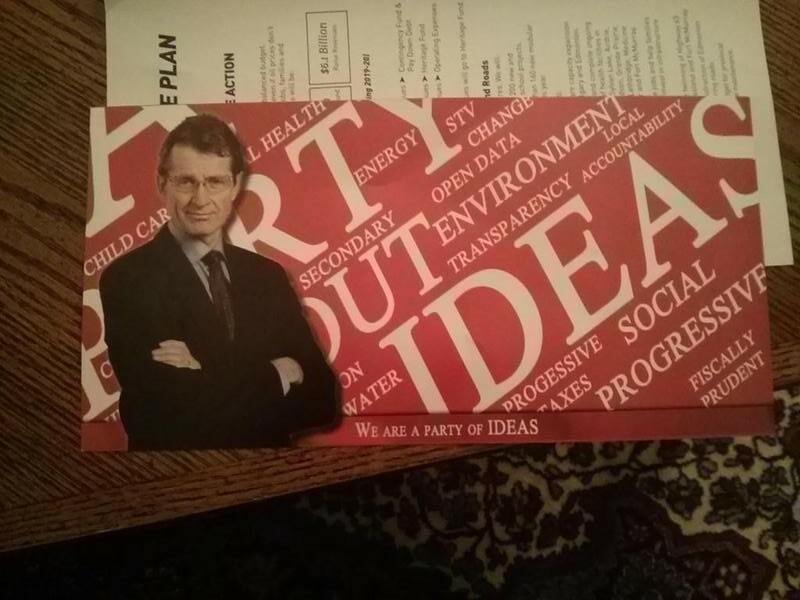 As a former executive assistant to David Swann during his first term as leader, the conversation inevitably turns to the Liberal party. Lots of my friends insist that the Liberal vote will completely collapse as voters flock to the most viable alternative to the government. Additionally, there is a sense that the party is in serious danger of being completely wiped out on May 5 and won’t win a single seat. Let’s talk about the collapse first, and then conclude with some crazy predictions. From the outside looking in, the party isn’t in great shape. It has been unable to field a full slate of candidates and will only have a nominated candidate in 57 of the 87 ridings—this is the first time since the ‘80s that the party has failed to field a full slate of candidates. The campaign launch failed to generate any positive momentum and—as the photos below illustrate—it is struggling to present a coherent and compelling narrative. So, things certainly look bad—no question about that—but what does the data tell us? 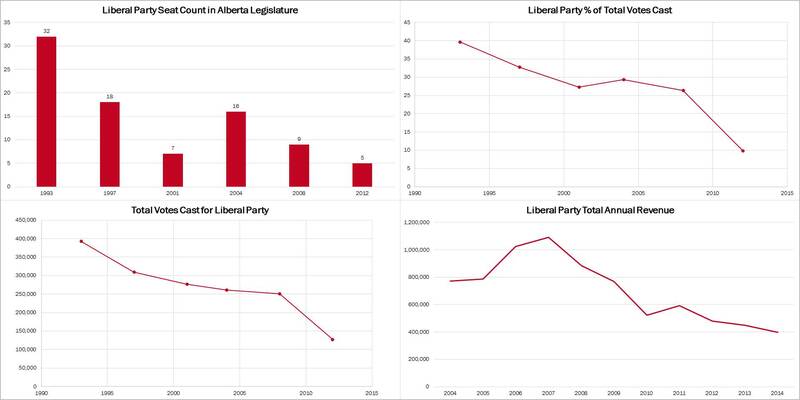 The charts below detail some incredibly troubling trends for the Liberal party. Collectively, the charts show that the party peaked in 1993 under Laurence Decore and has been in a slow decline ever since. In 1993, 392,899 people voted Liberal—in 2012, only 127,645 did. Over the same time, the Liberal share of popular vote has dropped from 39.7 per cent to 9.9 per cent. Unsurprisingly, over the same period of time, the Liberal seat count in the Alberta legislature has been trending steadily down from a high of 32 to five. Fundraising has also been rather grim of late. From 2004 to 2014 (the only years data is available), we see the party has gone from consistently raising about $1 million per year from 2004 and 2009, to raising just $396,796 in 2014. I understand that $400K is a lot of money, but the PC party raised $5,625,669 in 2014. If the Liberal party could increase its fundraising by a factor of 10, it would still be $1.7 million behind the PC party. So, votes are down, votes as a percentage of total votes cast are down, fundraising is down, and seats held in the legislature are down. The public face of the campaign is not going well and the trend over the last two decades—in virtually any category that matters—has been one of rapid descent. Whether or not the vote collapses on May 5 remains to be seen, but we can safely say that the party already has. Despite everything, I still think the Liberal party has a shot at electing some MLAs on May 5. Specifically, I think David Swann will be re-elected and Laurie Blakeman stands a reasonable chance of re-election. David received the most votes of any Liberal candidate in 2012; Laurie Blakeman was right behind him with second-most votes. David had the highest win margin of any Liberal candidate beating his opponent by more than 1,500 votes; and Laurie Blakeman was right behind him with the second-highest win margin at 1,300 votes. Both David and Laurie benefit from having well-organized teams that know how to win a local campaign. Finally, they both enjoy a unique X-factor that could push them over the top. For David, his X-factor is federal Liberal candidate Matt Grant. Matt has been door-knocking in the federal riding of Calgary-Confederation—most of which overlaps Calgary-Mountainview—for the last year and a half. Although the federal and provincial parties do not share data, Matt’s efforts are bound to have a positive spin-off effect for David. Laurie Blakeman’s X-factor is that along with being the Alberta Liberal candidate in Edmonton-Centre, she was also nominated to run for the Greens and the Alberta Party. 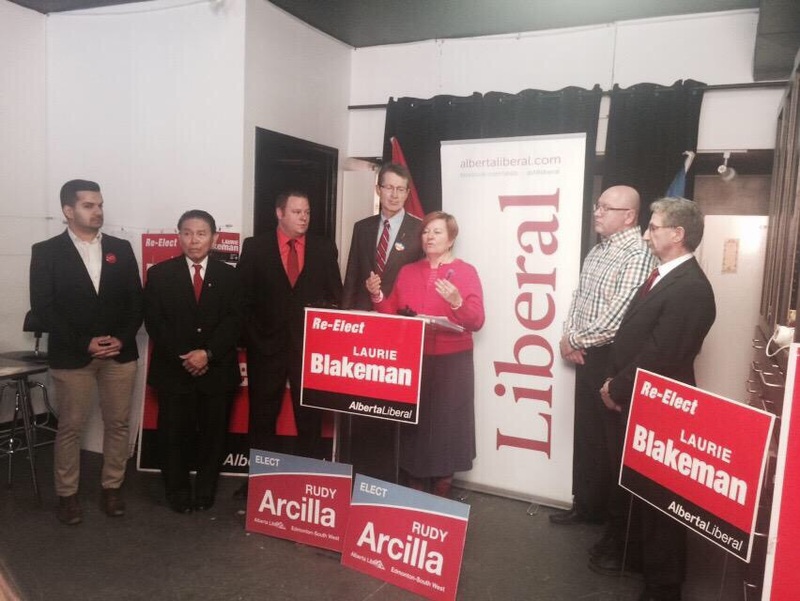 To comply with Elections Alberta rules, Blakeman will only be running for the Alberta Liberal party, but she won’t be facing competition from the Greens or the Alberta Party. It’s too early to say whether or not this clever maneuvering will work out in her favour, but it’s definitely interesting to watch. So, things are arguably worse than they have ever been in the past 20 years, and yet the party still has a chance to win a few seats. I guess that’s the problem, though—the Liberal party is good at winning a few seats. They need to start learning how to win most of the seats because that’s kind of the point.